To follow this series you will need Xcode, Cocoapods, PHP and Laravel installed on your machine. Some knowledge of Xcode and Swift will be helpful. In the first part of this series, we considered how to prototype our application, how to install and use Clean Swift templates to structure our application and how Clean Swift Architecture works. In this part we will be considering how to build our application’s API backend using PHP and Laravel. When building applications it is sometimes necessary to have an API. The API will be a central datapoint, which both our mobile application and web applications can connect to and implement as necessary. Let’s go ahead and see what we expect our API to be able to do. What will the API do? Based on our prototype, we have a few workflows that require some data. The API will help us provide that data, validate the user, and more. Authenticate users using email and password. Provide OAuth2 tokens to authenticated users. Use OAuth2 token to limit access to functionalities that are only for authenticated users. Allow users to add new contacts. Provide the contacts list for a user. Provide a Chatkit token so the application can connect directly to Chatkit. Knowledge of PHP and Laravel. PHP >= 7.0.0 installed locally. A Chatkit application. Create one here. Postman installed on your machine. When you have all the requirements, lets get started. Let us start creating our backend API by first setting up our project. To start, open your terminal application and run the command below to create a new Laravel application. This will create a new Laravel application in the chatapi directory. This will be our API project workspace. Next, you’ll need to create a MySQL database on your local machine. We will need the database for our API to store and retrieve data. 💡 You can use any database engine you feel comfortable with. You just need to edit your .env file to connect to the database. Next open the .env file and update the DB_DATABASE value to the name of your database. Also, update the DB_USERNAME and DB_PASSWORD to your database username and password. We will need these values to connect to Chatkit. You'll need to replace the placeholder values with the credentials from your Chatkit dashboard. To get a value for the CHATKIT_USER_ID you need to go to the inspector tab of your Chatkit dashboard and create a user. Whatever user ID you use there is the ID you should set as the CHATKIT_USER_ID env var. 💡 We need the chatkit_id column to store the ID of the user on the Chatkit servers. This will make it easy for us to link a user on our database to a user on the Chatkit database. The -mc flag in the command stands for migration and controller. This means that when the model is being created, it will create an accompanying controller and migration. The migration above will create a data structure is the same as the response Chatkit returns when rooms are created. In the migration above we have created the contacts table with the columns user1_id, user2_id, room_id, created_at and updated_at. The user1_id and user2_id will be unique columns and will be foreign keys to the user table. When user1 sends a request to add a new contact user2 to the API, the room will be created on Chatkit for both users, then the relationship will be saved to the database along with the room_id returned from Chatkit when the room was created. The model above is pretty self-explanatory. The user1, user2, and room methods just define relationships while the scopeFor method is an Eloquent scope that creates query builder shortcuts. In the model above we set $timestamps to false so Eloquent does not try to manage the database timestamps automatically. We set $incrementing to false so Eloquent does not try to manage the incrementing of id, the primary key. In the user model we have the setPasswordAttribute which is an Eloquent mutator for the password property. Great, now let’s install Laravel Passport. 💡 Please note the details (Client ID and Client Secret) for the password grant client. You’ll need the credentials in our iOS application when we need to generate tokens to make calls to our API. To learn more about creating OAuth servers using Laravel and Passport, read this article. In the class above, we have extended the Chatkit PHP SDK main class Chatkit\Chatkit. All we’re really using this for in our app is to help us create a Chatkit singleton, as you’ll see next. This will register the App\Chatkit class into Laravel’s IoC container and make sure every time Laravel attempts to resolve the class using IoC, the class will return an instantiated and configured instance of App\Chatkit. This will be useful when we inject the class into our controllers later. Now that we have installed the Chatkit PHP SDK and Laravel Passport, let’s go on to create our endpoints. An endpoint that handles login and provides a token for making authenticated calls to your backend API. An endpoint that handles sign up. An endpoint that returns all contacts for an authenticated user. An endpoint that handles adding a new contact. An endpoint that returns the Chatkit token for the authenticated user. The Chatkit token can be used to make calls directly using the Swift Chatkit SDK. We do not have to create the endpoint for handling login as Laravel Passport handles that for us. When we registered the Laravel Passport routes in AuthServiceProvider we registered some routes to our application. The one we are interested in is /oauth/token. When you send a POST request to the /oauth/token endpoint with the request body: username, password, grant_type, client_id and client_secret, we will get a token back for the user. In the create method, we validate the request data sent, it expects name, email and password, then when the validation passes, we generate a chatkit_id and create a new Chatkit user using the Chatkit PHP SDK. If it succeeds we create the user locally and save the chatkit_id so we can pull the associated user from Chatkit anytime we wish. That’s all for that endpoint. In the index method, we get all the contacts of the user and loop through each contact and append the contact to the contacts array. Finally we return the contacts as the response. In the create method we validate the request user_id (the ID of the contact to add) and then we create a room for both users on Chatkit. If the room creation is successful, we then create the contact connection in the database and return the formatted contact. In the generate_room_id method, we just generate a room ID using the chatkit_id of both users and run that through md5. The last endpoint we need to create is the endpoint that generates and returns a Chatkit token. This token will then be used by the iOS application to communicate directly with Chatkit if needed. In the controller we have the getToken method. This method uses the authenticate method of the Chatkit SDK to generate our access token that will then be used in the application to make requests to Chatkit directly. This is the final endpoint we have to create. Now you can visit the URL http://127.0.0.1:8000 and you should see the default Laravel page. Now fire up Postman. 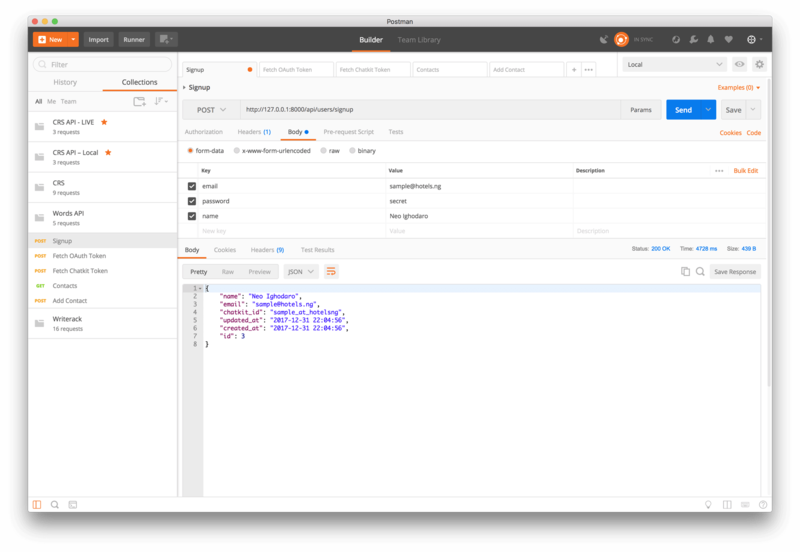 Download and import this collection to Postman. When you have imported the collection you can now make requests to your API to test the responses you will receive. ⚠️ You will need to edit the “Body” of the “Fetch OAuth Token” endpoint. In the Client ID and Client Secret have to match the Laravel Passport credentials you already have. Also, to make authenticated calls to the other endpoints you need to get the access_token from the “Fetch OAuth Token” call and then add it to the “Authorization” header of the endpoint you want to call. In this part we were able to create the backend for our iOS chat application. The backend was created using Laravel and PHP. Hopefully you picked up some things from this part. In the next part of this series, we will focus on creating the application itself. We will add the Swift logic and also we will build out most of the chat applications features. If you have any questions or feedback about the article, please leave a comment below. The source code to the application built in this series is available on GitHub.